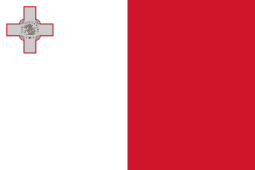 For the official currency of the Sovereign Military Order of Malta, see Maltese scudo. The lira (Maltese: lira Maltija, plural: liri, ISO 4217 code : MTL) was the currency of Malta from 1825 until 31 December 2007. The lira was abbreviated as Lm, although the traditional ₤ sign was often used locally. In English, the currency was still frequently called the pound because of the past usage of British currency on the islands. In 1825, an imperial order-in-council introduced British currency to Malta, replacing a situation where various coinages circulated, including that issued in Malta by the Knights of St John. The pound was valued at 12 scudi of the local currency. This exchange rate meant that the smallest Maltese coin, the grano, was worth one third of a farthing (1 scudo = 20 tari = 240 grani). Consequently, 1⁄3-farthing ( 1⁄12-penny) coins were issued for use in Malta until 1913, alongside the regular British coinage. Amongst the British colonies which used the sterling coinage, Malta was unique in having the 1⁄3-farthing coin. Between 1914 and 1918, wartime emergency paper money issues were made by the government. Until 1972, it was subdivided into 20 shillings, each of 12 pence with 4 farthings to the penny; from May 1972 it was divided into 100 cents, and the 1 cent into 10 mils. Pre-decimal British sterling coinage continued to circulate in Malta for nearly a year after it was withdrawn in the UK due to decimilization on 15 February 1971. Then in 1972, a new, decimal Maltese currency, the lira, was introduced, in both coin and banknote form. The lira was initially equal to the pound sterling, however this parity did not survive long after the floating of sterling on 22 June 1972. Emergency issues between 1914 and 1918 were in denominations of 5 and 10 shillings, 1, 5 and 10 pounds. In 1940, notes dated 13 September 1939 in denominations of 2 1⁄2, 5 and 10 shillings and 1 pound were issued, followed late in the year by a provisional 1 shilling note overprinted on an old 2 shilling dated 20 November 1918. Note production continued after the Second World War in denominations of 10 shillings and 1 pound, with 5 pounds notes reintroduced between 1961–1963. After the Central Bank of Malta was established by the Central Bank Act of 1967 and began operating on April 17, 1968, the issuing body named on the banknotes switched from "Government of Malta" to "Central Bank of Malta." While the designs of the notes remained unchanged, the colors were changed. The Central Bank refers to this series as the "CBM first series". The CBM second series began with the introduction of lira-denominated notes on January 15, 1973. Banknotes issued by the Government of Malta and then by the Central Bank of Malta were written in English up to 1972, with the denomination pounds (or shillings). From 1973 to 1985, they were written in Maltese on the obverse using the denomination liri, and in English on the reverse using pounds. From 1986 to 2007, Maltese and liri were used on both sides. Although using British coins, Malta did not decimalize with the UK in 1971. Instead, it adopted a decimal system in 1972, based on the lira (equal to the pound) subdivided into 1000 mils or 100 cents. The name "lira" was used on banknotes beginning in 1973, initially jointly with "pound", and exclusively on both coins and banknotes since 1986. Mils were removed from circulation in 1994. The Maltese lira was replaced by the euro as the official currency of Malta at the irrevocable fixed exchange rate of 0.429300 MTL per 1 EUR. However, Maltese lira banknotes and coins continued to have legal tender status and were accepted for cash payments until 31 January 2008. Maltese liri were convertible free of charge at all Maltese credit institutions until 30 March 2008. Maltese coins were convertible at the Central Bank of Malta until 1 February 2010, and banknotes remain convertible until 31 January 2018. The Maltese lira was on a par with the British pound sterling (GBP) until 13 December 1971, since then the lira had been allowed to float, anchored to a basket of reserve currencies. The lira had subsequently been worth around £1.60 sterling. After the Kuwaiti dinar, it was the second-highest-valued currency unit in the world, being worth US$3.1596 as of 28 April 2007. After the dollar weakened against other currencies in mid-2006, the lira was worth US$3.35289 as of 16 December 2007. Decimal coinage was introduced in 1972 (one year after the United Kingdom) in denominations of 2, 3, and 5 mils, 1, 2, 5, 10, and 50 cents. The division of the lira into 100 cents (rather than the 240 pence of the old system) meant that the cent was a relatively large unit - the United Kingdom introduced the decimal 1⁄2 penny for this reason. Malta went further in introducing the mil, equal to 1⁄10 cent. It will be noted that there was no one-mil coin. However, the coins that were provided (2, 3, and 5 mils) allowed goods to be priced (and change given) for any number of mils. In 1975, a 25-cent coin was introduced. On 15 January 1973, banknotes were introduced, denominated in liri on the obverse and pounds on the reverse, in denominations of 1, 5 and 10 liri. In 1986, 1 lira notes were replaced by coins and 2 lira and 20 lira notes were introduced. Four series had been issuing, designated the second to the fifth series by the Central Bank, with the first series in the pound. 1 2 3 4 Linzmayer, Owen (2012). "Malta". The Banknote Book. San Francisco, CA: www.BanknoteNews.com. ↑ "Cyprus and Malta to adopt euros". BBC News. 2007-07-10. Retrieved 2007-08-20. ↑ "Commission hails approval of the adoption of the euro in Cyprus and Malta". europa.eu. European Commission. Retrieved 2007-12-17. ↑ "Maltese Euro Conversion Process". Retrieved 16 July 2014. 1 2 "Maltese Banknotes and Coins - The Central Bank of Malta". Centralbankmalta.com. Retrieved 2013-12-25. ↑ Archived February 16, 2008, at the Wayback Machine. 1 2 European Central Bank. "The euro cash changeover in Malta". Retrieved 2008-01-02.